In compliance with the will of the dead khan, a kuriltai at Karakorum in 1228 selected Ogedei as khan. The kuriltai also decided to launch a campaign against the Bulghars, Turks in the region of Kazan on the middle Volga River, and to complete the conquest of the outlying Western Xia territories. By 1229 Batu Khan, grandson of Chinggis, had defeated most of the Bulghar outposts, and in 1231 Ogedei sent an expedition to conquer the Korean Peninsula. With the death of Chinggis Khaan, the actual domains of the Empire were broken up into four smaller Khanates. All had a considerable amount of freedom in the internal doings of their individual realms, but Ugedei controlled foreign relations and many aspects of taxation. In compliance with the wishes of Chinggis, as expressed presumably in his legal code, the yasaq, his vast empire had been apportioned among his sons (only three survived; the eldest, Jochi, had died in 1227), and his sons' descendants, subject to the overall authority of the khan at Karakorum, which was rebuilt in 1235 by Ogedi. Jochi's son, Batu, ruled the region to the north and the west of Lake Balkash. Chagadai, the second son of Chinggis was given the southwestern region that includes modern Afghanistan, Turkestan , and central Siberia. He and his successors were known as the khans of the Chagadai Mongols. By implication, this realm extended indefinitely to the southwest, as Batu's did to the northwest. Ogedei and his progeny were awarded China and the other lands of East Asia. Tului, the youngest of the four principal heirs, was to have central Mongolia, the homeland, in accordance with Mongol custom. He and his descendants, however, were to share Mongolia's precious fighting manpower with the other three khanates. Ugedei continued his father's campaigns, taking the Mongol empire to its greatest extent, and reaching into Eastern Europe. He also continued campaigning in Persia, and finally defeated the Chin in northern China. Additionally, he gave the Mongol Empire a capital city - Kharhorin (known more commonly in the West as Karakorum). In 1231, Ogedei decided to destroy Jin. He formed an alliance with the Song, then sent Tului southward with a large army into Jin territory. In 1232 in the middle of the campaign, Tului died, and Subetei took command. He continued on to besiege Kaifeng, the Jin capital. Despite the defenders' skillful use of explosives, the city fell to the Mongols after a year's siege. Subetei then completed the conquest of the Jin empire, driving many of the Jurchen back into their original homeland, but absorbing others into the Mongol army for the further conquest of China. Ogedei refused to divide the conquered region with the Song, which in 1234 attempted to seize part of the former Jin empire. This was the signal for another war, which lasted forty-five years. Ogedei committed the Mongols, whose total population could not have exceeded 1 million, to an offensive war against the most populous nation on earth, while other Mongol armies were invading Iran, Anatolia, Syria, and the steppes of western Siberia and Russia. By this time, ethnic Mongols were a minority of the Mongol armies. The remainder were Turks, Tatars, Tangut, Cumans, Bulghars, and other Inner Asian peoples. Nonetheless, the confidence with which the Mongol armies embarked on these farflung wars was almost as remarkable as the invariable success of their operations. The kuriltai of 1235 authorized at least two more major offensive operations: one against Tibet, the other in Eastern Europe. The Tibetan expedition was led by Godan, son of Ogedei, and the conquest was completed in 1239. Ugedei died in 1241, and his death resulted in a vigorous battle for the throne. His own chosen successor, his grandson Shiremun, was considered too young to rule and his widow, Turegene, wanted her son, Guyuk, to assume the title of ‘Khaan’. The throne of Guyuk did last until 1246. 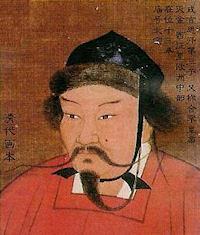 Munkh, a descendant of Tolui succeeded him to the throne and, after the death of Munkh, Khubilai ascended to the throne. By this time the Empire had fragmented into the four smaller Khanates: the Yuan dynasty in China, the Golden Horde in Russia, the Chagatai Khanate in Central Asia, and the Il-Khanate in Persia. The Yuan dynasty came to an end in 1368, and the Golden Horde defragmented into smaller states: Astrakhan, Kazan and Krimea, the latter of which survived up to 1783.